This should be the golden rule of tidy cooking - before you even think about pulling out a chopping board, empty the dishwasher, or better yet, get a little helper to do this job before you step into the kitchen. Then re-stack the dishwasher as you cook. If you don't have a dishwasher, fill the kitchen sink with hot, soapy water. As you work, drop in the utensils and dishes you've used into the water and let them soak. Washing up will be a cinch when the gunk easily slips off from pots and pans and all that's needed is a quick rinse and dry. Those pizzeria owners are onto something with this tip - to catch mess quickly, line your working space with butcher's paper (or place a sheet of baking paper under a chopping board), then fold it up with the scraps and toss it when you're done. Easy-peasy. It goes without saying that the simpler the meal, the less mess there is to clean up. Make your life easy by cooking these sensational slow-cooker family favourites. And the best part? You'll only have the one pot to wash up afterwards! Clear away any dishes and ingredients you've used for preparation before you start cooking. Likewise, after you've finished one task, have a quick tidy up before you start the next one. Cleaning up in stages like this will lighten the load at the end. Keep a bowl beside your cutting board to toss scraps into as you work, instead of spreading it over the bench top. Avoid unnecessary elbow grease by lining baking and roasting pans with foil to save scrubbing them later. Likewise, spray measuring cups and spoons with non-stick spray so gooey ingredients, like honey, slide right out and the cups and spoons clean up easily. Tuck a tea towel or cloth into the waistband of your apron to wipe up small spills to stop them from becoming sticky blobs that need scrubbing later. Tap into your inner female superpower by doing two things at once. So while the water is boiling, load the dishwasher, while the oven is firing up, do a quick wipe up and while the rice is cooking, sweep the kitchen floor. You'll be amazed how much you can get done while cooking. 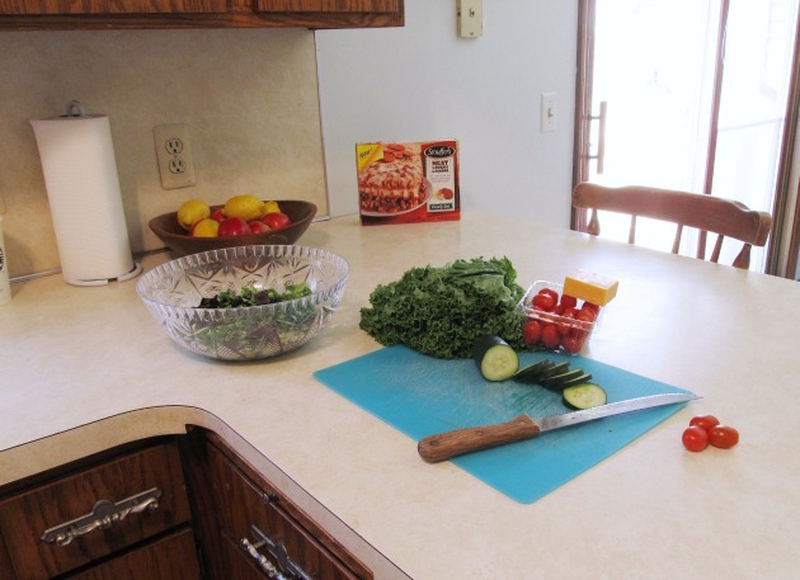 Before you start meal preparation, do a little clutter busting to clear your work space. If you don't have much time, read these five minute clutter busting tips. And lastly, flick the switch on your dishwasher before you go to bed. Server responsed at: 04/19/2019 8:44 a.m.